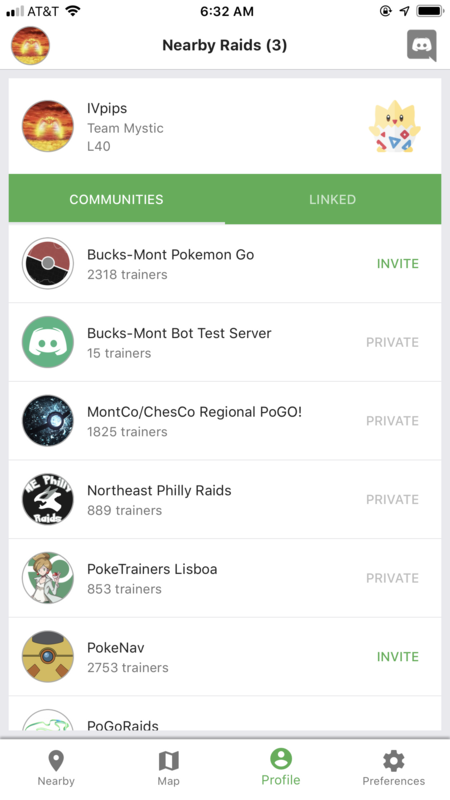 The mobile app is a discord companion app available for free to all users of PokeNav. It allows you to quickly view nearby and global raids in a manner that would be impossible with just discord. You can install the PokeNav mobile app from the Google Play or iOS App Store. In order to make best use of the mobile app and see your raids on the map, your server will need to make sure it is properly configured. To show a raid in the app, PokeNav needs to know its hatch and despawn time, as well as the exact coordinates of the gym where the raid is occurring. If it fails to detect either of these it may show up in discord but not on the map. Only one raid per gym is over shown in the app. EX raids are never visible. You can easily tell if a raid is visible in the app by the icon in the lower left corner. To enable invites, $toggle share-invite-url #channel, where the channel is the welcome channel you want new users to appear. Use $set location to tell PokeNav where your server is located. This allows PokeNav to begin detecting your raid commands and screenshots for gym locations. PokeNav needs to know about the gyms in your area. If $show-settings shows no gyms after setting a location, you’ll need to add your gyms, see POI Commands. You can correct raid reports if PokeNav fails to read the time or gym properly. See Raid Page for more information how to set the gym or despawn time of a raid. You can easily tell whats wrong with a report by checking two places, the gym directions line or the hatch time field. If you want to use the app like a raid map, you might not want channels created for every raid announced. Instead, consider disabling raid channels until someone joins them for the first time, see the moderation docs on how to do this. We have created a siri shortcut that makes uploading images to discord much faster and use less bandwidth. In a nutshell, this resizes and converts the image before giving you the option to share to discord. Afterward, it deletes the image from your photo library. You can use this to take a screenshot, go to the home screen and tap to share an optimized screenshot. Upload happens instantly. It then deletes the image and returns you Pokemon Go. If you need additional help, you can seek out help from your fellow users on the PokeNav Discord Server.